The china I'm using today is English, a vintage pattern by Myott/Staffordshire. The name of the pattern -- Medici -- conjures up visions of a very different culture and thoughts of turbulent romance, powerful influence, and notorious intrigue. Italy’s House of Medici (or de' Medici), patrons of Botticelli, Michelangelo, and Galileo, was a dynasty said to have had more wealth, passion, and power than the houses of Windsor, Kennedy, and Rockefeller combined. It shaped all of Europe and controlled politics, scientists, artists, and even popes, for three hundred years. Their wealth and influence initially derived from the textile trade. They were able to bring Florence under their family's power, allowing for an environment where art and humanism could flourish. They fostered and inspired the birth of the Italian Renaissance. 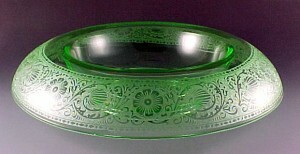 Medici porcelain was the first successful attempt in Europe to imitate Chinese porcelain. The experimental manufactory housed in the Casino of San Marco in Florence existed between 1575 and 1587 under the patronage of Francesco I de' Medici, Grand Duke of Tuscany. Never a commercial venture, Medici porcelains were sometimes given as diplomatic gifts. Even though this is a relatively simple table for 8, I thought of the Medicis as I polished candleholders and unwrapped silver goblets. I thought of Catherine de' Medici (mother of three kings of France), blamed for the excessive persecutions carried out under her sons' rule, in particular for the St. Bartholomew's Day massacre of 1572, in which thousands of Huguenots were killed in Paris and throughout France. Many of the persecuted French Protestants emigrated to Colonial Virginia. My ancestors were among them. "Before forks were introduced to Italy in the 11th century (and later brought to France by Catherine de' Medici) there was no need to 'set the table.' Individuals all would have been expected to have brought along their own knives." 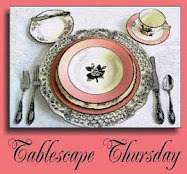 Please join Susan of Between Naps on the Porch for Tablescape Thursdays. Susan and her talented friends always provide wonderful inspiration and heart-warming hospitality. Thank you for your visit. I'm very glad you stopped by today! Bill, again an astonishingly beautiful setting. The Medici china is so beautiful, (in my book anything blue and white is!) and the lovely reflections off the silver and crystal is amazing - I love polished silver. Bill this is so pretty! I love the china, I think it is some of the prettiest I've ever seen! The goblets are also gorgeous. You are the most talented tablescaper!! I love the way you weave stories and facts in your table settings also. Bill, once again remarkable. I just fell in love with those plates. I think I'll be searching for those far and wide now. I always learn so much coming here. The goblets are amazing. Next week I'll be showing my "Bill inspired" crystal, because that is what you do.. inspire us. thank you again for a most lovely post filled with facts, fantasy, and gorgeous photos! what shall I say? Same as always. You catch perfect every spirit you ever want. This is Rainaissance from the plate sover the silver goblets to the candlelight. And while I am enjoying your wonderful table I always involuntarily peek to the door for Catherine de' Medici who has to arrive nattering with her royal household and to take their places. And I see her in my imagination lackadaisically waving with her hand and saying the same words as I would say, if I would be she: "Just perfect, Bill!". Thank you dear Bill for your nice words!!! Bill -- another perfect table! You put them together so well -- and everything is always so elegant -- and I love all of your china and silver! Another beautiful work of art. I always enjoy reading the information and/or history you provide on your beautiful china, silverware, crystal, etc. You get some great deals on your flowers. I must be missing the mark downs at the Kroger I shop at the most. If DB doesn't wind up with the Medici, put me next on the list. I am a sucker for blue china...or anything blue. The whole tablescape is beautiful. Beautiful setting. Your silver and crystal glassware are gorgeous! Great job as usual! Your table is wonderful but your photography is also amazing. When the lights go down and the candles are lit you really get some great shots. I love the Medici pattern. I remember you showed this once before, and it has stood out in my mind as a favorite. Your table looks so very elegant. You always pay such attention to detail, and it shows. Love the views by candlelight too. Nicely done! Oh, I DO love the Medici! What a great find. Thanks for sharing. I am so envious of your talent - including the photography. Everything is just gorgeous. Thank you for giving me a chance to see this lovely china and crystal again! I love it all. It is so true, beauty can be affordable. We are having our 1st blast of a Canadian Winter outside. Thank you for the feast for the eyes of your beautiful warm table.....as usual! Bill, you have managed to set another beautiful table. I love, love the Rose Point. Beautiful as always! I love the formal china with your Rose Point. Wow, this is so elegant and gorgeous, Bill. Love the gleaming candelabras and the silver goblets. And your chandelier looks beautiful and shining as well! This post is especially beautiful. I am so drawn to blue and silver together; I suppose it is the coolness of it all. It is a good thing you are extra neat in polishing and drying your crystal because surely any "smudge" would show in these clear photographs!! You are so very talented. I really enjoy visiting your dining room because you present everything so well. It is as if I am really there. Lovely table! Enjoyed the refresher course on Medici history and adore the Medici china! What a beautiful and elegant table Bill. Your silver and crystal just glisten in the photos. I've never seen this pattern before--its gorgeous. Especially like the stemware. It is awesome! A pleasure to visit your place. What a fantastic table! I'm glad you included the history on the Medici china. It is lovely! The stemware is stunning! Oh Bill... of all the china you have used, that is my very favorite. I love the entire table. It's elegant yet very warm at the same time. What a gorgeous tablescape! Very elegant! All that silver has my head spinning! YUM! I love it! As always you are the master! Every aspect is absolute perfection! I'm such a fan! Just beautiful! I always enjoy your stories and the trivia additions as well! Those goblets are my favorite, so lacy and feminine! I hope you had a nice Thanksgiving, and looking forward to a wonderful Christmas! This is one of my favorites of yours. I love the china and you did a wonderful job with the flowers on this table. You make me want to add a silver candelabra to my collection! I'm not sure what it is exactly, but all the pieces really come together for me on this table. Love it! Oh Bill, Bill, Bill, Bill, Bill, Bill, Bill!!!!!!!! You're killin' me, Bill! This is stunning! The china is too gorgeous for mere words! The goblets are so, so pretty and the flatware is Divine. (Notice the capital D? :-) ) Oh, my gosh...fabulous design! Those votive holders are really slick, too. Very unique. I like the depth. I am mesmerized by each and every element. Just gorgeous!!! I continue to be amazed at the great deals you find at your local Kroger store. I wish they'd bring Kroger back to my area! Sorry to hear about the persecution of your ancestors. I get that. Have a good one, and I look forward to checking in on you next week! By the way, I'm still checking thrift stores and not finding deals nearly as good as the ones you encounter. Rats!!! Bill...this is so gorgeous. I love the china, but the crystal stemware is amazing...I've been looking at it(and looking only!!) on ebay. I also love your history lesson! Thank you! Bill, your table just takes my breath away, its stunning. At first I glimpse I thought you were using Lenox Autumn for your china. Thank you for introducing me to yet another pattern. Your crystal just beams, thank you so much for sharing this fantastic table with us. Bill, gorgeous as usual. Blue is my favorite colour and I always love a little blue china. Thanks for the Medici trivia! I love the glassware also. Wow! Thanks for including all the sources - I am rather envious of those estate sales of yours...! I think I might blog about you on my blog. I noticed that most of my readers are not here - I thought many of my decor crowd would have discovered you. I see some familiar names but must write you up for my readers to enjoy!! Bill, Lovely table as usual. I love that Dollar Tree is represented amongst all that elegance. I would have never guessed. The china is so beautiful but there is a simplicity about it. Perhaps it's the blue and white. I have been away for a while but I always enjoy your combination of tablescaping mastery and history. I should have stayed home and traveled with your tablescapes. Would've saved me a lot of money. Your commentary always helps to whisk one away if even for a moment. Well, this table just turned out lovely and regal. The china is gorgeous. But, I have to say, I am in love with the silver goblets. Just stunning. Bill -- It's always such a delightful treat to be "seated" at one of your lovely tables! I love the wonderful background you also lay before us -- It's like a guided museum tour! Thank you for reminding me about the knives. I knew that but had forgotten. Bill, I love that fact about the knives! I just marvel at the elegance and beauty I find at your tables each week. Each detail is so perfectly chosen. I spend most of my days in jeans, chasing toddlers with my camera or deadheading the roses. You make me want to put on my best dress and enjoy each and every moment at this table. What an elegant dining room! Thanks for sharing! 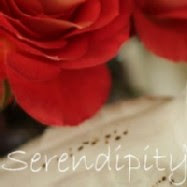 Hi Bill, Your Tablescapes are so Beautiful like all ways, love your flowers from Krogers this is the place to go Bill. Your tables are always so exquiste. I take a long time looking at all the beautiuful touches that go into them. I am just a plain jane kind of decorator but it is special to be able to look at how it should be done. Wonderful as always. The golden glow of that last photo is just magical, Bill. In fact, the whole table has the magician's touch, from the elegantly formal china (I ♥ it!) to those EXQUISITE Cambridge, Rose Point stems...TDF!! You continue to teach, inspire & amaze me. We actually saw & learned lots about the Medici family's political dynasty when we were in Florence, Italy about 6 years ago. I loved walking the streets & bridges of that beautiful city. It was one of my favorite stops on the whole tour. Funny how your ancestry is French Protestant, mine is Irish Catholic, we both love anything Italian & I couldn't help but think that this icy blue table would be PERFECT for the start of the Jewish Hanukkah or Festival of Lights, which started this week!!! Truly an ecumenical experience! i love it bill...you've put staffordshire, cambridge and silver on dollar tree placements. there's hope for me yet. and as always, it's stunning. Elegant table, Bill as always. I continue to learn something new from your posts. Thanks. Your posts are not only a visual feast, but the little history lessons and background stories make them so interesting as well. The blogs I always come back to are more than pretty pictures! Yours always qualifies. Hi, Dear Bill! Oh, you constantly amaze me at your talent of setting the most beautiful tables. Those dishes are so pretty and everything else. I do appreciate your stories too! Oh, I'm so glad you got to see my little Carter! This is my first time being a grandmother and it's wonderful! Hope you had a fabulous Thanksgiving. Well, sweetie, you did it again. Just when I think you are about "played out", you come back with a flourish. This is so stunning, it leaves me breathless. And, your amazing house is knocking my sox off..it is so beautiful. AND..your pretty words just make it all magical. Thanks so much for taking the time to make something beautiful for your readers. I know that we ALL appreciate it and love everything you do. The history lesson was so interesting - you always have such interesting information and elegant tablescape! Would be an honored guest at your table - even if I had to bring my own knife... thanks so much for sharing! Mmmm...what a deliciously beautiful table! I really love the color of this china. The color really comes out in the candle glow.I love the griffins in the border pattern (at least I think they are griffins?). Bill, I apologize for arriving so late. Can't miss one of your tables though. This is such a gorgeous, regal table. It doesn't get any better than this! Hope you are enjoying the delights of the season. Another amazing tablescape as always. Everything is simply gorgeous. Love that blue china, it is so elegant and pretty. Those wine goblets are absolutely breathtaking!! They stole my heart right away. You did a fantastic job as always. Always enjoy my visit. May you have a Christmas Season full of love, joy and peace. As graceful and elegant as always. I love the information, not only lovely, but a learning experience too! Thanks for sharing with us. Your table gleams! but of course the etched goblets steal my heart. Thanks for the tidbit Bill. God Bless Catherine for bringing forth the fork! How absolutely mid-evil.